Tucked into high-rises of downtown Toronto, the Harbourfront Centre is an urban treasure located on shore of the picturesque Lake Ontario. 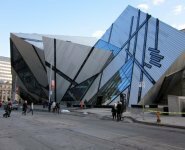 It is one of the most popular Toronto attractions, where you can easily splurge your whole day, especially on a beautiful summer day. The centre offers amazing blend of family-friendly activities  magnificent music concerts, arts display, food festivals, theatrical performances, film festivals, cultural events and dance shows at this vibrant venue commonly create a buzz. 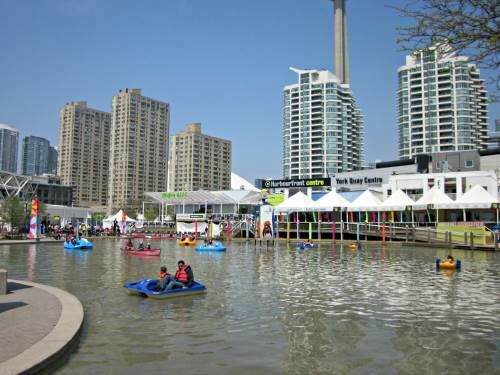 Harbourfront Centre is also great place to spend a quality time boating, biking, dining, sightseeing, strolling, sailing, skating, shopping or simply sitting and enjoying views of Lake Ontario. Built on the site of abandoned warehouses, the centre opened in 1974. Since then it has grown by leaps and bounds. 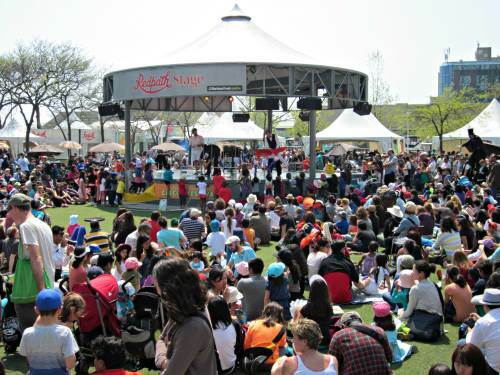 Today Harbourfront Centre is a very popular year-round cultural and recreation venue with over 4000 events a year and attracts approximately 12 million people each year. Stretching from York Street to Bathurst Street along Queens Quay West, the sprawling 10-acre centre consist of two major buildings  Queen's Quay Terminal and York Quay Centre housing art galleries, theatres, museum, speciality shops, gift shops, restaurants, ice-cream parlour, and information kiosks. Outside you will find the Natrel Pond, famous Toronto Music Garden, and WestJet outdoor performance stage. 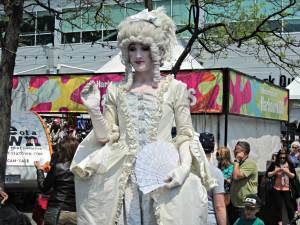 Toronto Harbourfront Centre offers a wide array of cultural events, ethnic festivals and performances showcasing the multicultural and rich diversity of Toronto. May to October is usually pretty busy period and you will find something going on during every weekend. The most well-known and prominent event is the International Festival of Authors. This literature festival lures more than 100 literary celebrities to perform readings and interviews. The Toronto Harbourfront Reading Series is another popular literary event where distinguished authors, poets, novelists and biographers offer public reading programmes. Join Canada Day celebrations and enjoy diverse cultural programs and fun activities. Plus, spectacular fireworks display at night has its own charm (however, fireworks show is not offered every year). If you are a food-lover, you will enjoy the smell and savour of tantalizing cuisine at Hot & Spicy Food Festival, Vegetarian Food Festival, and Pan American Food Festival. For music aficionados, the Harbourfront Centre presents several wonderful festivals including Ritmo y Color, SoundClash Festival, TD Toronto Jazz Festival, NXNE (North by Northeast), and Calypso STARS. You can enjoy live entertainment and concerts FREE. Toronto International Circus Festival showcases jaw-dropping stunts, side-splitting comedy, stunning juggling, magnificent magic shows and astonishing acrobatic acts. Tirgan Festival, Philippines Festival and TELUS TAIWANfest bring the art, culture and cuisine of Iran, Philippines and Taiwan respectively. There are many more interesting events and festivals for kid, young and adults. With its small and intimate venues, Harbourfront Centre offer great opportunity to enjoy music, dance and theatre performances thoroughly. From rock and rap to jazz and classical, celebrated headliners to emerging talents, Toronto Harbourfront Centre has seen it all. The centre offers tons of live concerts either on outdoor WestJet stage or at Enwave Theatre, where you can enjoy fresh and hot music. Many of the concerts are free. 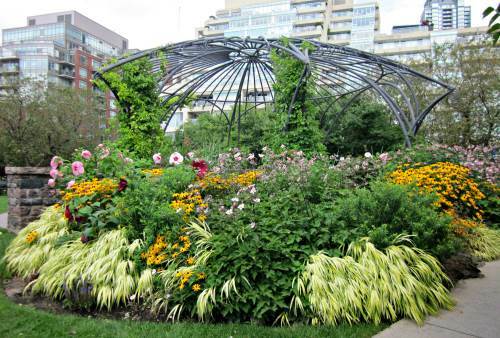 Enjoy outdoor concerts in the Toronto Music Garden, a lush green venue designed by cellist Yo Yo Ma and landscape designer Julie Moir Messervy. If you are a big fan of cutting-edge, innovative theatrical performances, head to the Fleck Dance Theatre and Enwave Theatre for some brilliant, intuitive, and critically-acclaimed performances. For film fans, Harbourfront Centre presents inspiring, inventive and interesting films from all around the world. The documentaries and short films offer great insight into current affairs, fiery issues and new cultures. 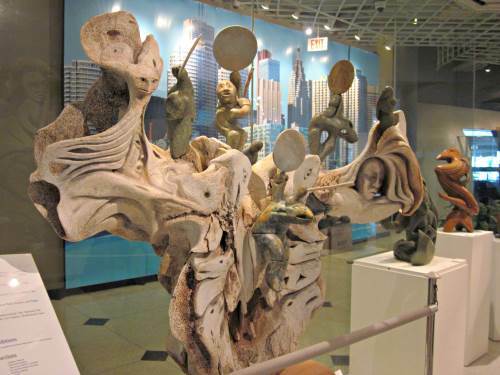 For the classy-arty enthusiasts, Harbourfront Centre has several venues displaying innovative, modern and ground-breaking arts and crafts. The contemporary Power Plant art gallery offers exceptional visual arts exhibits and insightful shows throughout the year. Devoted exclusively to Inuit art and culture, the Museum of Inuit Art (MIA) takes you into history of Canada's Arctic region with its fantastic collection of more than 300 artifacts including ceramic works, stone sculptures, and prints. Located just besides the WestJet stage, the Natrel Pond offers relaxing canoe and paddleboat rides in summer (lines can be pretty long on weekends). And during winter, it is transformed in the largest artificially frozen outdoor skating rink, ideal for some great skating experience. You can do strolling along the boardwalk and enjoy cool breeze coming from the Lake Ontario. When the weather is pleasant, it's nice to unwind while watching planes land at the airport over the water. Or watch the different boats, yachts and cruises sailing in the calm water. There are some excellent bike paths around, so you can easily explore the area on bike. There are plenty of water-related fun activities and tours, plus marina for docking your private boat or yacht. 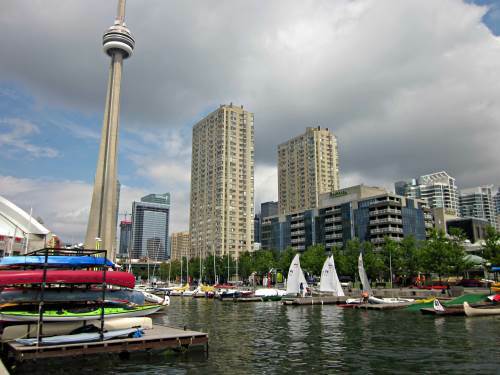 One of great way to experience and explore Toronto Waterfront is to take a boat tour leaving from Harbourfront Centre. 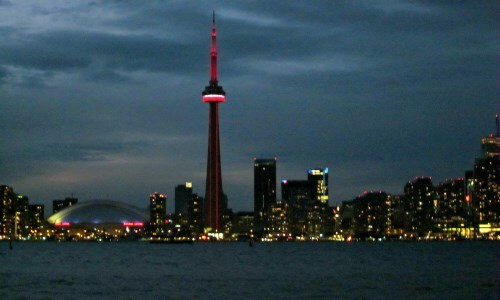 Toronto harbour cruises offer you great opportunity to capture spectacular vistas of towering Toronto skyline, captivating Toronto Islands and magnificent Toronto waterfront. You have the option of sightseeing cruise tour which generally lasts for one hour or more colourful and exotic lunch and dinner cruises where you can savour gourmet food, drinks and enjoy live entertainment. If you love shopping, you will certainly find something that appeals your mind and soul. The Centre Shop is a unique little gem where you can find unusual accessories, gift items, and lots of stuff designed and created by Canadian and international artisans. You can buy home and personal accessories, jewellery, watches, stationary, cameras, books, magazines, greeting cards etc. 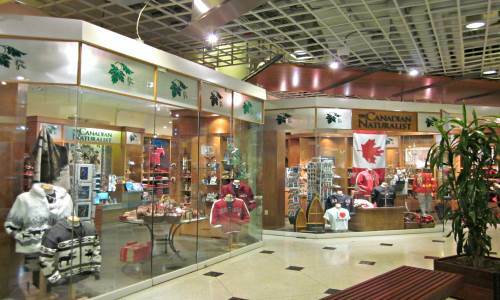 The Queen's Quay terminal offers tons of boutique style shops selling toys, clothing, accessories, souvenirs and gifts, jewellery, and much more. In summer, the Lake View Market (formerly International Marketplace) features vendors selling unique hand-made eco friendly goods, traditional artifacts, crafts and other products from world over. Feeling hungry? There are some very tasty options to top up your empty belly! The World Café offers variety of international cuisine for the craving foodies and helps them satisfy their insatiable taste buds. You can have fine casual dining at the Lakeside Local Bar & Grill in an al fresco setting, enjoying the fabulous views of Lake Ontario and excitement taking place around theWestJet Stage and Netrel Pond. The Watermark Irish Pub and Restaurant in the Queen's Quay terminal building offers large variety of gourmet food, weekend brunch, drinks and desserts. 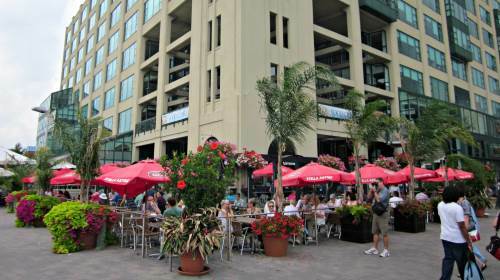 Enjoying dinner at waterfront outdoor patio is indeed a great way to end your day. 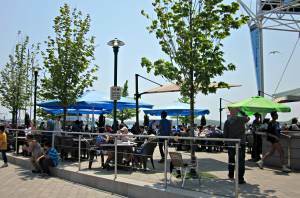 Harbourfront Centre is short 5 minute streetcar ride from Union Station. Take the 509 Harbourfront streetcar from the Union which will drop you off at the Harbourfront Centre. 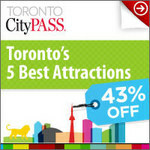 Take the Go Transit bus or train to the Union Station. From Union Station, the centre is 10 minutes walk southwards. From the North - Take Highway 400 into Toronto, exiting onto Highway 401 West. Continue until you reach Highway 427 southbound. Follow Highway 427 to downtown via the QEW/Gardiner Expressway. Take the York Bay exit toward Yonge Street. Follow the signs for Yonge Street/Queens Quay. Turn right at Bay Street toward Queens Quay West. From the South or West - Follow the QEW into Toronto, where it turns into the Gardiner Expressway. Take the York Bay exit toward Yonge Street. Follow the signs for Yonge Street/Queens Quay. Turn right at Bay Street toward Queens Quay West. From the East - Take Highway 401 into Toronto and exit onto the Don Valley Parkway Southbound. Take exit toward Downtone/Richmond Street and merge onto Eastern Avenue. Then turn left at Parliament Street. Continue onto Queens Quay E until you reach York Street.